Welcome to the Pet Partners Press Office! If you are interested in featuring Pet Partners and the work of our therapy animal teams, we would love to hear from you. In addition, we can arrange interviews with volunteers around the country. Our volunteers visit many different facilities including senior living, veterans, educational, hospitals, and hospices. 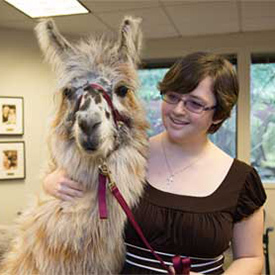 The species of animals we register includes dogs, cats, mini-horses, mini-pigs, rabbits, birds, guinea pigs, llamas/alpacas, and domesticated rats. Just let us know what works best with your feature. To contact the press office please email press@petpartners.org or call (425) 679-5514 and we will be happy to assist with your media inquiry. Jan. 2, 2018 – New Research Says Therapy Dogs Are OK!